The time mobile field forces - salespeople, technicians, auditors, emergency staff - spend travelling represents between 30 and 50% of a working day. The Opti-Time range of Field Service Management solutions improves mobile field forces' efficiency on the ground. Flexibility, tighter callout slots, commitments kept. Balanced workload, less stress, lower staff turnover. Reduced mileage, lower fuel consumption and CO 2 emissions. Complementary modules: overall optimization, long-term optimization, advanced management of districting availability. 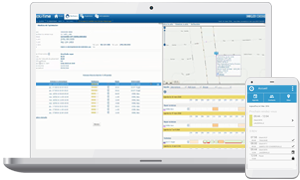 Real-time and batch, unlimited number of constraints and business rules. 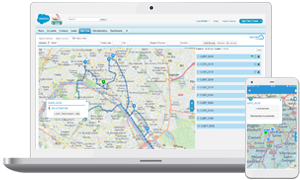 CRM/ERP/HR connectors, web services, connection to geolocation tools. Allodiagnostic optimizes its real estate diagnosticians' rounds with GEOCONCEPT. "Today we have an efficient, coherent and flexible route planning system that takes account of the mobile teams' work load and their various business constraints."